Domestication, taming is more right I think, of wild elephants is rare anywhere in the world anytime. In India it was not so for the last many centuries. Although tiger is the designated national animal of the country now, I am sure any non Indian cannot think of an India without coming to the mind simultaneously that of an elephant! Elephant has been the 'de facto' national animal of India for them. In India these days 'love' for the elephants is limited to few states or places. But there is a whole state and society which adores the elephant even now.Come the age of metros and malls or online shopping, mobile apps and world class automobiles (but not roads),deep affinity of the society towards this pachyderm continues unabated in this most literate state of India- Kerala, that too from one end to the other, more or less among all classes of people. Till recently one could see an elephant walking on national highways . An elephant in the front yard of a feudal house was a common sight which is considered to be aristocratic! I don't think this was there anywhere else in the world-an elephant in the front yard of a house! 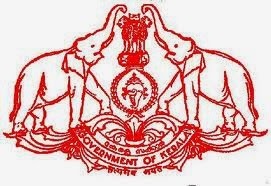 It is so popular that Govt of Kerala in its official emblem since inception features two elephants prominently to this day! In Kerala state of India, the history of tamed elephant is unique. Hardly it was used for waging wars but only for peaceful means ! They are used to this day mainly for Hindu temple festivals and related processions. To a much lesser extent it is used in christian church processions and some mosque events also. They are also used for work especially in timber industry where cranes are not available. Being home to the largest domesticated elephants in India, it is an integral part of the culture of the state, represents the Kerala ethos. Mostly they are owned by temples and individuals.Famous Guruvayur temple has over 60 tamed elephants which are housed in an elephant 'palace' nearby. Even an annual race among the elephants is conducted at Guruvayur! During my school days, when Kochi was a small town , sighting a tamed elephant on the road was so common ! 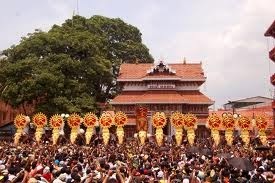 Now the authorites have changed the law as they can be transported only by truck.Another matter is that only in Kerala , tamed elephants are ornamented- caparisoned with golden coloured nettipattom during the festivals.Elephant pageantry which is an unusual display is an important part of temple worship. There are hundreds of such festivals in Kerala each year but the festival which is most famous and colourful is one at Trissur. Elephants are not fully domesticated since it is captured in the wild , tamed and then trained.It seems breeding among tamed elephants is not practical due to very long reproduction cycle. There are at least two such training centres in the state. Mahouts are trained there while captured elephants are tamed by men and elephants who are trained for the purpose. These centres and festivals are frequented by international tourists but yet to attract attention of the number they really deserve! Tamed elephants in Kerala is beside the fact that a large population of wild elephants exists in the forests and wild life sanctuaries like one at Thekkady . Guruvayur Kesavan is the most famous captive elephant which is no more. It was so popular among the section of the people who are elephant fans that when died in 1976, a statue was erected! Many publications, movies and TV serial is produced on its honor and death anniversary is celebrated at Guruvayur where the statue is erected. Tamed elephants in Kerala have names like any other domestic animals like cow, dog, cat..But it should be noted that cows and elephants have Indian(Hindu) names where as dogs and cats in general will have western christian names !! One of our popes- Pope Leo x had an elephant as a pet which was presented to him on his coronation by king Of Portugal in 1514, assumed to be originally from India! Elephant making in wood is very popular art in Kerala and many houses will exhibit these carvings made out of single piece of wood in their drawing room! 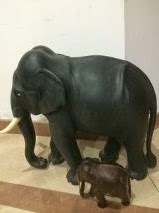 This craftsmanship has to be really good so that the features of the elephants in wood should look realistic. One such elephant, reasonably big in size for a house was gifted to my late brother by his friend who belongs to an erstwhile feudal family . My brother in turn gifted this to me about 18 years back which was taken to Doha and kept in our drawing room there!Now it is at Kochi as a prized possession. Elephant exhibits a wide range of behaviour including grief, memory and language, it seems.Each male elephant goes through a periodic condition of 'musth'. During this period the animal goes through an highly aggressive behaviour towards humans and other elephants. Predictably in many occasions the animal goes off its senses and ends with a lot of damages including killing people around. While the elephant fans point out the reasons towards the bad treatment of the animal , those who oppose have their views- after all it is a tamed wild animal.Strangely it is more likely that the mahout or others are blamed for such sad stray incidents than the animal! If it would have been any other animal like a tiger or a lion , it would have been killed instantly but not a tamed elephant in Kerala! Like it or not the adoration towards the elephant will continue in Kerala.....Gods Own Country. In any case this is unique experience which only Kerala can offer to the world !! Courtesy: Photos are from Kerala Tourism except the last one which is clicked by me.